(CNN) — As smartphones bleed into all parts of our life, a common New Year’s resolution for 2015 will be to cut down on phone usage and be more present in the moment. Some people can easily turn off or ignore their phones. But many have the urge to compulsively “just check,” no matter what conversations and activities are going on around them. That’s because each notification, like and communication is a stimulant that acts as a pleasure hit to the brain, according to Dr. Catherine Steiner-Adair, a clinical psychologist and author of “The Big Disconnect: Protecting Childhood and Family Relationships in the Digital Age.” It creates an instant sense of excitement and being needed. The irresistible urge to look at a smartphone screen also can stem from a fear of missing out and compulsive and addictive behaviors. If you lie and say you’re checking your phone for work when you’re not, or wake up in the middle of the night and have the urge to look at your smartphone, it might be time to cut back. Phone checking is contagious. One person picks up their device, then everyone else in the room takes it as a cue to check theirs. At home, this makes it hard for one person to change their behavior without the help of their family. It’s easy to justify scanning Twitter when everyone else around you has already tuned out. Come up with an understanding of how you’re allowed to use technology at home. Set aside specific times for smartphones, such as everyone can check for 15 minutes after dinner. Create screen-free zones in your home, by designating rooms where nobody is allowed to check their smartphones or tablets. Start with the bedroom, where fewer glowing screens can improve your sleep and maybe your love life. Buy an old-fashioned alarm clock and leave the phone in another room, or just have a ban on phones for one hour before bed. Parents are increasingly absorbed in their smartphones while with their kids, whether it’s at the playground, in a restaurant or at home. Steiner-Adair says she often sees children who are frustrated and fatigued from trying to get their parents’ attention. “At a certain point, children feel like being at the park and pushing me on the swing must not be that much fun to you because you’re talking to somebody else,” she said. Look for cues from kids that you’re too absorbed in your devices. Younger children might throw away or hide a phone, or throw tantrums to get attention. Older kids might tell you directly or withdraw into their own devices. There is the argument that smartphones allow us to be more flexible about when and where we work, allowing for more time physically spend with families. But always being just semi-present can have a negative impact on kids. “Kids often feel like you’re not really here, you’re not paying attention,” says Steiner-Adair. Levi Felix is the founder of Digital Detox, which arranges retreats where people pay to hand over their screens and spend time in nature, talking face-to-face with people, and reconnecting with the real world. He suggests replacing the times you’re checking your phone with real-world experiences. Take a step back and ask yourself why you reach for your phone. Are you looking for a connection or are in search of a community? Does the constant archiving of your life stem out of a fear of dying? Or is it just boredom? Make a list of things you want to accomplish and keep that piece of paper on you. When you feel the urge to check creeping in, take out the paper instead of your phone. Instead of automatically Instagraming or tweeting about a good experience, try something more analog. “Document it in different ways that ingrain you more in the experience, like drawing or writing about it,” said Felix. Many phones already have built-in tools that can help you create boundaries. First, turn off notifications. Use filters to make any necessary exemptions so that your boss or grandmother can always get through. Use away messages to let people know you won’t be responding to their emails. Set expectations about when you are working and stick to them. Parental controls are a great way to self-discipline. Set timers for yourself, turn off access to distracting apps during certain hours. There’s even an app called Moment for tracking your phone usage like calories. Perhaps a little reality check about how much you pick up your device will help motivate you to put it away. One casualty of smartphones is quiet time. The brain needs a break from constant input and stimulation to rest. “If you feel anxious or bored and you turn to a screen every time you’ve got free time, that’s a sign you’ve lost some essential ways of being with yourself,” said Steiner-Adair. Devices can also be a quick escape from an awkward in a social situation or a way to avoid interacting with someone when you’re mad or upset. Instead of disappearing in a device, force yourself to spend time in the messy, mind-numbingly dull, or unpleasant real-world situations around you. It might give you something good to tweet about. The RoboSimian disaster-response robot has four limbs, seven cameras and a LiDAR system. (CNN) — When we imagine the robots of the future, they often look and move like humans, standing up on two legs and using a pair of arms to grab and move objects. NASA’s Jet Propulsion Laboratory is working on a different kind of robot for disaster response that’s designed to move like an ape. Headless but covered with seven cameras that act as “eyes,” the RobotSimian has four identical limbs that do double duty as arms and legs. Together, they ably move the robot across rough terrain and rubble but can also pick up and manipulate objects. It has wheels it can coast on if the surface is smooth enough. The RoboSimian is JPL’s final entry into the DARPA Robotics Challenge, a 27-month-long competition among some of the world’s top robotic talent to create an emergency response robot. In situations such as a nuclear disaster, one of these robots could go into environments too dangerous for human rescue workers and execute simple tasks such as lifting debris off survivors or turning off a valve. In June, RoboSimian and up to 18 other finalists will have to make their way through an obstacle course that simulates eight common scenarios. Each robot will attempt to drive a car, move across rubble, use a tool and climb stairs, all without a human controlling it. DARPA says the final competitors should be as competent as a 2-year-old child. The winning team will receive a $ 2 million prize. 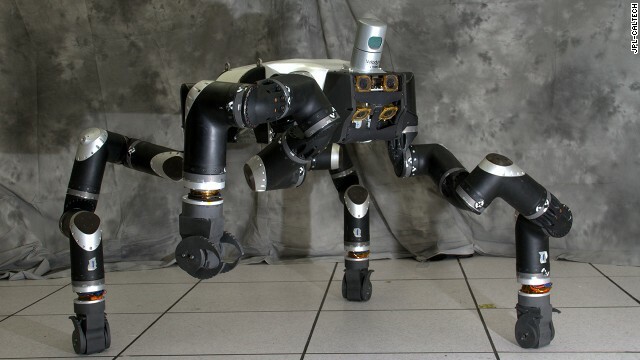 JPL used leftover parts from RoboSimian to create another robot called Surrogate. The more traditional upright robot has a flexible spine, head and two arms. While better at manipulating objects, Surrogate ran on tracks and wasn’t as adept at traversing the complicated terrain that is common in a disaster. After considering both candidates, the team decided to take RoboSimian to the finals. One trade-off is that RoboSiman is slower than many other competitors. JPL’s team is working with the University of California, Santa Barbara, and Caltech to increase the robot’s walking speed. “It is intentionally the tortoise relative to the other hares in the competition. We feel that a very stable and deliberate approach suites our technical strengths and provides a model for one vital element of the ‘ecosystem’ of robots that we expect to be deployed to disaster scenarios in the future,” said JPL’s Brett Kennedy, who is supervisor of the Robotic Vehicles and Manipulators Group. The Jet Propulsion Laboratory is most known for designing robotics for space exploration, such as the Mars rovers. But the DARPA competition was an opportunity for the JPL group to take its existing robotics research and compare approaches directly to other talented teams. NASA also has a long history of taking technology developed for space exploration and using it here on Earth. RoboSimian software was influenced by programs used to control the Mars rovers. In both cases, the system is designed to let the robots work as autonomously as possible when communication with a human operator is dropped. Spotty communications are common in disaster scenarios (and on Mars). The team has thought hard about all aspects of RoboSimian’s design, even making sure it has the right look. While JPL is focused on perfecting the ape-like design for Earth-bound applications for now, this is just one stop in the circular life of NASA technology. “We intend to spin the technologies developed for the terrestrial RoboSimian back out to applications in space,” said Kennedy.